The Pilot Whale is actually a dolphin and well-known for mass strandings. Regardless of their name, Pilot Whales are are actually dolphins. There are actually two species of pilot whale in the genus Globicephala. These are the long-finned pilot whale and the short-finned pilot whale. They both have the same black or dark gray body color and shape. Hence, it’s almost impossible to tell them apart out at sea. So analyzing their skull structure is the best way to identify each one. These are widely distributed dolphins and they range nearly worldwide. But while the long-finned variety lives in colder waters, the short-finned ones lives in tropical and subtropical waters. Pilot whales are among the largest oceanic dolphins. In fact, only the Orca (killer whale) is larger. They are highly social creatures. The pilot whale’s pod structure is such that both male and female offspring remain in their mother’s pod. This is quite an unusual trait among mammals though certain killer whale communities also do the same. Just like other dolphins, this species exhibits a high level of intelligence. As a matter of fact, people working with them describe them as “extremely intelligent.” As a result, they are very easy to train and they do well in captivity compared to other cetaceans. 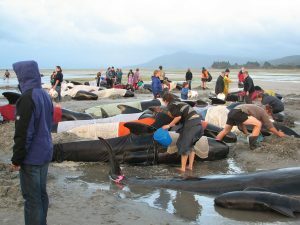 However, pilot whales are prone to beach stranding. They are one of the most common species you’ll find in mass strandings. There is little information regarding their exact population in the wild, hence the IUCN lists it as Data Deficient. The Pilot Whale can live from 45 to 60 years out in the wild. The long-finned pilot whale adults grow up to approximately 6.7 meters (22 feet). The males are usually longer compared to females who averagely measure 5.7 meters (19 feet). On the other hand, short-finned pilot whales males grow to around 7.2 meters (23.6 feet) long and the females measure approximately 5.5. meters (18 feet) long. The average weight of male short finned pilot whales is about 3,200 kg (7,055 lbs) and 1,500 kg (3,307 lbs) and for the females. Male long finned pilot whales weigh approximately 2,300 kg (5,071 lbs) and females weigh around 1,300 kg (2,866 lbs). These dolphins are referred to as the “cheetahs of the sea” and they can reach a maximum swimming speed of 23 mph (37 km/h). Like most whales, pilot whales are friendly and usually love to approach boats. They are generally curious and friendly oceanic creatures. There is no evidence or record that shows a pilot whale has ever harmed or killed a human being. Instead, humans hunt it. The Japanese in particular savor its meat so it’s often a target of their whaling efforts. Unfortunately, their tendency to travel in large groups of up to 100 makes them easy targets for hunters. A Short-finned female pilot whale becomes sexually mature at around 9 years old and the males at about 13 to 16 years. The long-finned female pilot whale matures at around 8 years and the males at 12 years. Male pilot-whales typically have multiple mating partners due to the fact that the male to female ratio is about 1:8. The mating period depends on their location. For the Long-finned pilot-whale, a lot of mating and calving occurs during summer with a gestation period ranging from 12 to 16 months. Meanwhile, short finned pilot-whales in the southern hemisphere have the highest number of births in autumn and spring after a gestation period of 15 months. Pilot whale calves measure between 5 and 6.5 feet long and weigh up to 165 pounds at birth. They usually nurse for about three years. Though the lactation period can extend to allow for a closer mother- calf bond. The females pilot-whales have one offspring after every 3 to 6 years. The Short-finned Pilot Whale species is one of the few mammal species where females undergo menopause. Their main diet is squid, although they also eat herring, octopus, cuttlefish and other small fish. They have 40 to 48 teeth which are used for grasping/catching. The adults’ food intake can reach up to 30 pounds per day. While hunting, these dolphins work in a group to surround prey and centrally trap it before they kill and feed on the it together. They have the ability to dive to depths of up to 600 meters (1,969 feet), but most of their dives are between 30 to 60 meters (98 and 197 feet) while in search of prey. Most shallow dives usually take place during the day while the deepest ones take place at night. The International Union for Conservation of Nature (IUCN) lists both pilot whale species in the Red-list of Threatened Species as being Data Deficient. There are laws in place to protect these animals in certain countries but whalers still hunt them because their conservation status is not clear. They are also often taken as bycatch by commercial fisheries. John Edward Gray was the first person to describe the short-finned variety from only skeletal materials in 1846. The long-finned pilot whale was first categorized by Thomas Stewart Trail as the Delphinus Melas in 1809. Later, its scientific name was changed to Globicephala Melaena. The specific Melaena name was again changed to the original Melas in 1986. Although different types of species classifications have been proposed, only two have been accepted for use. The global population distribution of long-finned whales is classified into two parts: The largest population is found in North Atlantic Oceans extending towards the South Carolina waters, Morocco, Iceland, Western Mediterranean Sea up to Norway. The smaller population inhabits the circumpolar band of the Antarctic Ocean. The less populous short-finned whale is found mostly in the warm waters of the Atlantic, Pacific and Indian Oceans. In Antarctic and North Atlantic oceans temperate waters, its population slightly overlaps with that of the long-finned species. Generally, pilot whales are nomadic although some populations stay throughout the year in places such as Hawaii and some parts of California. 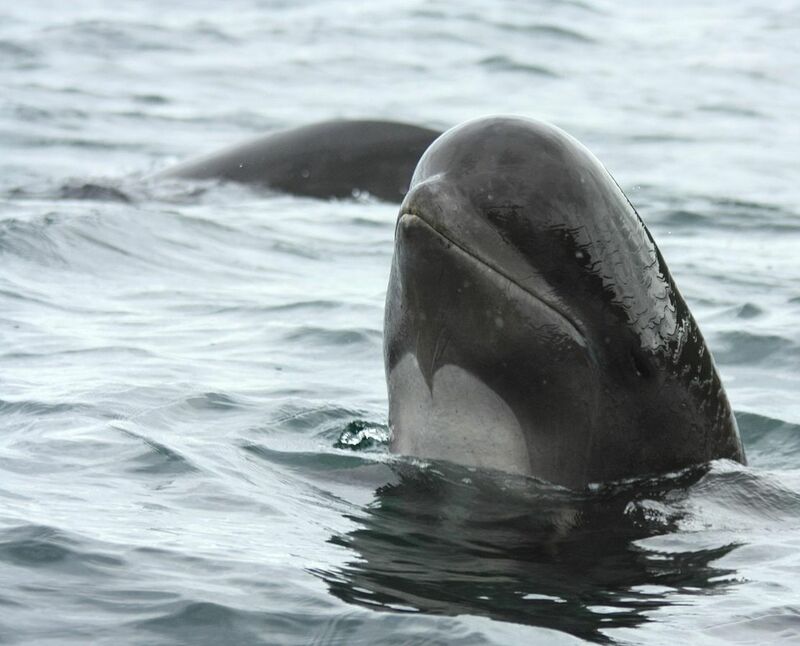 Long-finned pilot whales tend to prefer cold deep waters with some of its populations permanently residing offshore although they may move inshore to search for food. Short-finned pilot whales prefer warm tropical & sub-tropical waters with most of its population living around the external boundaries of the continental shelves. However, there have been reports about some individual short-finned pilot-whales moving towards the coastal regions and sometimes as far as onshore where they get stranded. This entry was posted in Species Profile and tagged blackfish, dolphin facts, dolphin species, dolphin species profile, killer whale, largest dolphins, orca killer whale, pilot whale, toothed whale on October 12, 2017 by Roselyn Onuche.